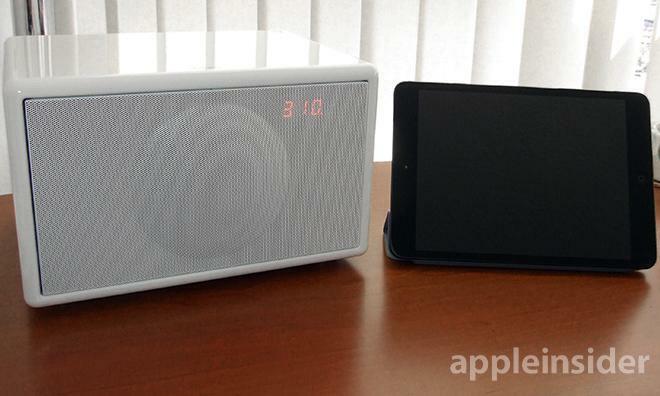 After introducing its first product in 2006, Geneva has become a recognizable marquee in iOS-minded speakers, extending a singular Apple-esque design theme across its entire range of audio products. With the Model S Wireless, the firm has tried to marry high quality cabinetry with equally robust sound that has traditionally required a hardwired connection in Apple's 30-pin dock connector. As with many Swiss audio firms, Geneva Lab spends a lot of time working out details in the wood shop. The Model S Wireless' walnut veneer cabinet is crafted, sanded, lacquered and polished all by hand. The end result is a product with a well executed design that feels as sturdy as it looks. The aesthetic is stark. 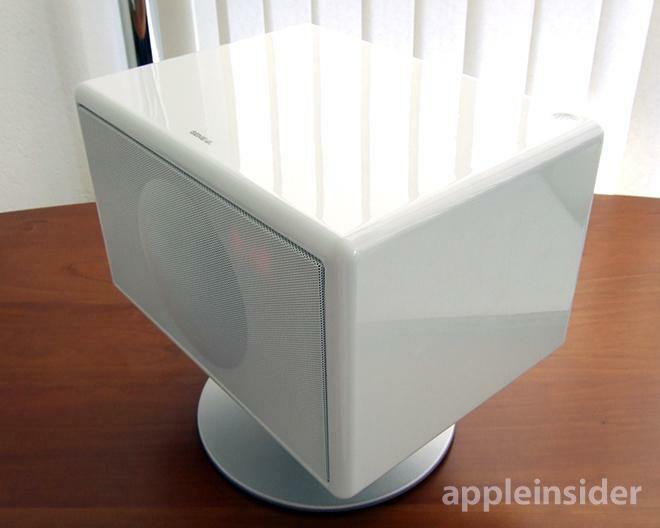 A simple, highly polished box with rounded edges and a metal speaker grille that bears the unit's one design flourish: a large extruded partial hemisphere. Ensconced in the straight lines, the large "bubble" becomes a strikingly bold feature, one that is carried across Geneva's entire product line. Geneva Lab designed the S Wireless to be used with or without the included aluminum stand, which can be unscrewed from a threaded anchor located at the bottom of the speaker. Attached to the hefty pedestal is a generously thick slab of rubber that both isolates the unit from vibrations and provides a non-slip surface to rest on. Four feet made of the same soft rubber material are also provided for use when the stand is not attached. 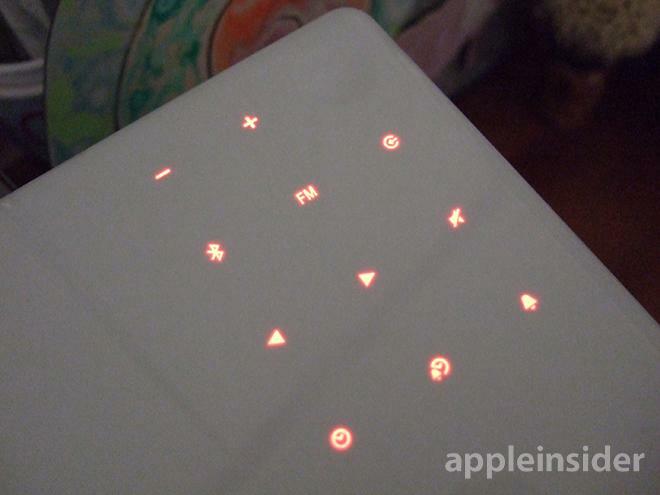 The surface of the S is bare, with capacitive "hidden" controls aligned in the top right corner, as seen above. Symbols bearing a button's function are backlit in red when powered on, and disappear when off. A thumb-sized dimple, which is also touch sensitive, acts as the power button. A simple LED display hidden behind the grille reads out sources and other information, while added extras include an alarm clock and FM radio compatibility. 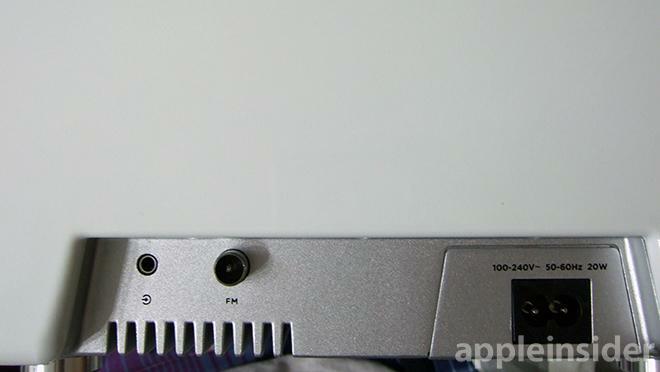 On the back is a line-in jack, FM aerial port and a socket for the built-in 20-watt power supply. Listening to music streamed from an iPhone 5 over Bluetooth, the main attraction of the S Wireless, proved extremely clear, though it took some work to get there. At first, we found the sound to be tinny, lacking body and texture. With the positioning of its bass ports and dual three-inch full-range drivers, the speaker needed to be placed in a "sweet spot" to reach even an acceptable level of output. 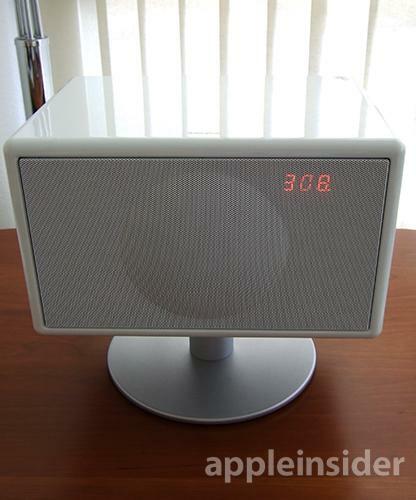 As with many small displacement cabinets, this is not a speaker that can standalone anywhere in the room and sound great. After a few attempts at finding the right location, the S got its bass back, mixing nicely with mid-range and even the higher register tones that were previously overbearing. In testing, we found positioning the speaker about two to three feet away from a wall gave the best performance. A bit more room is needed if you're sitting in a corner or near a large window. Once the location was dialed in, the speaker's character mellowed significantly. The S can be typified by its neutrality, though this is not to say that all genres were presented with equal aplomb. When running over Bluetooth, the digital-to-analog converter's attenuation was a bit aggressive and the amplifier clipped bass somewhat, even when that setting was loosened to its max. Without feet to stand on, some genres with deep-thumping beats, like house, jungle and certain rock cuts, seemed anemic. Bass was present, and extremely tight, but lacked the "oomph" felt in competing products. Strings and woodwinds in chamber orchestras were faithfully reproduced, but the lack of resonating bass took away from the experience of some pieces. There were times, however, that the perhaps overly neutral low end became a plus, especially with live "unplugged" recordings and modern pop tunes. The lack of a boomy bottom is well suited for a number of genres, especially technical listening and almost anything dominated by the vocalist. Jazz was hit or miss depending on the band, performer and arrangement. The highs were well handled, with no sibilance present in any track we auditioned. There was a rough spot with a lack of proper decay for cymbals crashes, but the associated shimmer was impressive for a speaker without dedicated tweeters. While the bass is shaky and the highs slightly underrepresented, the mids were exquisite. We have never tested a system so small with such smooth, extremely well balanced and silky mid-range reproduction. Sound like this is usually reserved for higher-end multi-component setups. The midrange draws over a decently wide dynamic range with a non-fatiguing, clean sound. Vocals are delivered clearly and confidently, never slipping into pitfalls of over presenting or coloring the original recording. The S produces what is quite possibly the best midrange in its class. As for stereo sound, the S Wireless has a narrow soundstage typical of small cabinet speakers. Because of the two drivers, however, output wasn't as laser-beam focused as some other competing products. At the appropriate distance and angle, the sound was more than acceptable. Overall, Geneva Lab did a great job in this regard. Another plus is the Model S Wireless' lack of distortion at high volumes thanks to its two class D 15-watt amps. We cranked the unit up to its limiter after breaking in the coils for a few hours and heard zero cracks or distorted tones. Tonal balance surprisingly remained fairly consistent through to the top. The S Wireless may not be as loud as some other speakers, but it was enough to generate some concern from our neighbors. Line-in from a CD transport offered more dynamic range than Bluetooth, but nothing to write home about. FM band reception was good and a nice added feature, though we hardly used it given the number of Internet radio options available to stream from our couch. 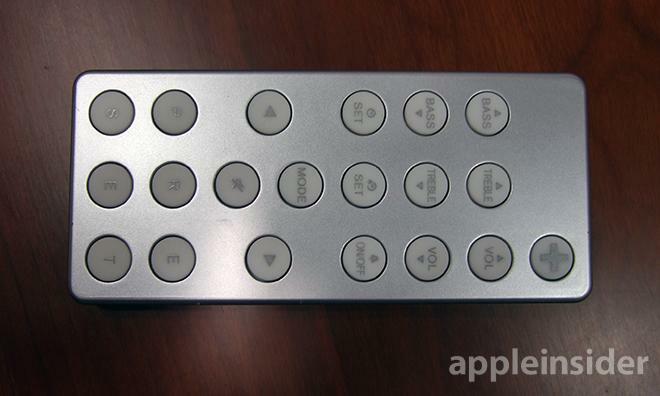 We did have some minor quibbles with the included remote, which felt like it was built by a different company. The creaky and hollow plastic body completely contrasts the built-like-a-tank S Wireless to which it pairs. Button clicks are nice, but we had problems transmitting signals from even short distances. For a speaker that so heavily touts its wireless capabilities, which will presumedly be used to play music while away from the unit, the accompanying remote should be better executed. In many ways, the Model S Wireless is a great speaker system. It may lack a powerful low end, but for many who intend to use it as a desk unit, this won't be a deal breaker. Room-shaking bass is not a feature befitting small cabinet speakers, and that Geneva Lab didn't overextend downward and sacrifice tonal balance is commendable. The bass that is represented is taut and accurate. As mentioned above, the midrange is just amazing, and for us is worth the price of admission alone. Build quality for the speaker is almost as good, though the problems with the remote control still bother us. Overall, Geneva Lab's Model S Wireless has a few minor shortcomings, but brings a lot to the table  or desk  for its size in connectivity and, most importantly, sound. The Model S Wireless sells for $300 from Amazon and comes in Black, White and Red colors.